IN THE LOOP offers 25-30 local, fun and exciting events per month. From outdoor activities, foodie nights, concerts, parties, movies, wine tastings, even sporting events...you name it, you can experience it with In The Loop! Tailgate with us to a Seahawks game, join us for a wine tasting at Chateau Ste. Michelle or make a day of it with us at a concert at the Gorge! Event Leaders are running the activities and always there to make introduction! We plan events from Seattle to Tacoma to the Eastside! Simply add an event to your calendar and off you go! 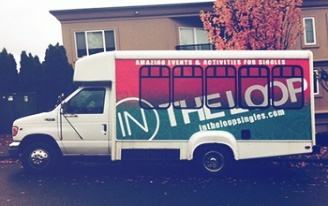 SKIP THE TRAFFIC.In the Loop has our own party bus to help shuttle our members to some of our awesome activities. Make new single friends while you travel in style! Speed Mingle Ready, Set...Speed Mingle! Meet a ton of new single friends as you jump from table teams of 8 to new table teams of 8 answering fun- pre set questions about yourself and meeting new ITL members in a fun, fast paced, cocktail party setting. Day at Pike Place MarketJump on the In The loop party bus! Make new single friends as we shuttle you to downtown Seattle for great eats, new friends and flying fish!